Photos from a rock climbing trip to Red Rocks Nevada with my college buddy and climbing partner, George Kopf. My wife Sandy took most of the pictures. Great weather, not too hot yet, but the crowds had started to thin a little. Tons of desert wildflowers, and more wildlife sightings than I remember in any of my other trips to Red Rocks: burros, coyotes, hummingbirds, switfs, frogs, and more lizards than you could shake a cactus at. We had 3 days of climbing.... first day was Crimson Chrysalis, an 800+ foot, 9 pitch, 5.8+ in Juniper Canyon. Day 2, Frogland, an 850 foot, 7 pitch 5.8- in Black Velvet Canyon. 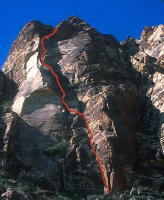 Day 3, we took it easier, Dark Shadows, a 350 foot, 3 pitch 5.8-, in Pine Creek Canyon, on the north side of the Mescalito. View of the peak by Juniper Canyon. Home of Crimson Chrysalis. Crimson Chrysalis goes up the shaded side of the column at the top of this ramp. My friend George Kopf and my wife Sandy. Long shot of George finishing the last pitch of Crimson Chrysalis. zoom in of me near the top. Note the traffic jam of climbers. Route topo for Frogland. Photo used by permission of www.supertopo.com Copyright Greg Barnes. Frogland is my favorite climb in Red Rocks so far. Long, sustained, remote, with some route finding challenges. The crux is a balancy slab under a roof, where a fall would make for a bad swing. There is a huge chock stone on the next pitch that you squeeze behind. Just past the crux of Frogland, the face under the small roof. You can see the big chock stone near the top of the frame. Topping out on Frogland. The descent is a relatively straight forward walkdown/scramble through a gully system. North East face of the Mescalito. Cat in the Hat is on the sunny south face of Mescalito, Dark Shadows is located on the north face. East face of the Mescalito George leading the 1st/2nd pitch of Dark Shadow. Pitch 3 Dark Shadows. Topping out on Dark Shadows. You can keep climbing to the summit, but the most people here.